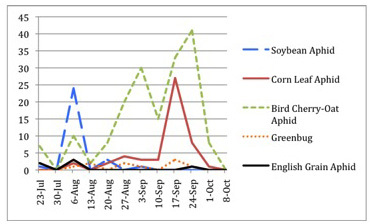 Data from the North Central Regional Soybean Aphid Suction Trap Network sheds light each year on 1) abundance of soybean aphid migrating from soybean to its overwintering host, buckthorn, in the fall and 2) spring colonies from overwintered eggs on buckthorn in spring. The suction trap network provides general indication of soybean aphid population development potential for the subsequent season based on fall trap captures. 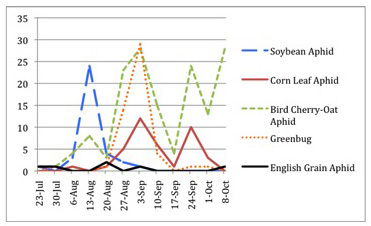 Although the pattern does not always hold for all sites in the region, low soybean aphid fall flight corresponds with low intensity of spring migrants from buckthorn to soybean the subsequent growing season. Even in years of high fall flight trap captures, fall/spring weather and temperature, entomopathogenic fungi, and natural enemies (predators and parasitoids) can regulate soybean aphid populations on buckthorn in spring before soybean aphid moves to soybean. However, for the 2010-2011 cycle this does not appear to be the case. 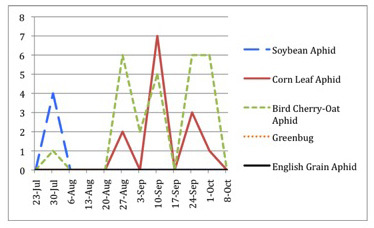 There simply were very few soybean aphids captured fall 2010 at our 7 Wisconsin suction trap sites, and throughout the North Central region. May 11-13, 2011, David Voegtlin, Illinois Natural History Survey, conducted his annual spring survey for soybean aphid on buckthorn in a few North Central states. After the very low numbers recorded in the regional suction trap network last fall, he was not expecting to find much, if anything in the way of soybean aphids on buckthorn. General locations visited on his three-day trip included the Rome City area in Northeast Indiana, Toledo area, Irish Hills in Southeast Michigan, Kellogg Forest near Battle Creek, Michigan, Calumet area South of Chicago, Joliet and Quad Cities areas of Illinois. All of these sample sites have abundant common buckthorn (Rhamnus cathartica) and some have glossy buckthorn (Frangula alnus) as well. A number of soybean aphid colonies were found at the Kellogg Forest and Quad Cities sites. After extensive searching in the Rome City area, only one colony was found. No soybean aphids were found at any of the other locations. Given the cool spring weather, soybean aphid development has apparently been off to a slow start this spring. Colonies had only wingless adults and nymphs. No winged aphids were observed, neither were any natural enemies. We think that in years with very low fall flight, the soybean aphids that do make it back to buckthorn are in such low numbers that predators do not find them easily. The opposite seems to happen in years of high fall flight. Predators, particularly Harmonia axyridis (multi-colored Asian lady beetle), flock to heavily infested trees in high numbers. Although Wisconsin was not included in David Voegtlin’s spring buckthorn survey, I expect our overwintering populations and current spring soybean aphid on buckthorn to be equally scanty. 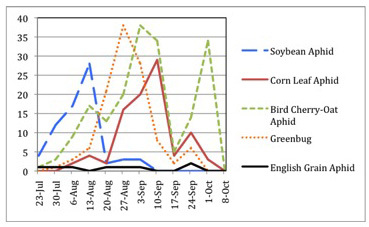 Figure 1-6 shows fall flight trap captures for soybean aphid, as well as corn leaf aphid, bird cherry-oat aphid, greenbug and English grain aphid. I include the later four aphid species because they are important as barley yellow dwarf virus (BYDV) vectors to winter wheat in fall. Figure 1-6. Wisconsin soybean aphid suction trap network 2010 fall flight of soybean aphid as well as BYDV vectors to winter wheat (corn leaf aphid, bird cherry-oat aphid, greenbug, English grain aphid). 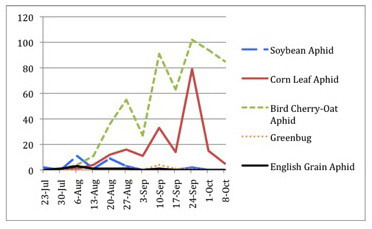 From these figures you can glean a quick picture of how low Wisconsin’s soybean aphid fall flights were. You can also see the late summer/early fall activity of corn leaf aphid and bird cherry-oat aphid, typically the two most abundant BYDV vectors to wheat in Wisconsin. (English grain aphid and greenbug are also present, but usually in lower numbers in fall suction trap captures). This clearly illustrates why one of the best ways to reduce incidence of BYDV transmission in winter wheat during fall is to observe planting dates that correspond with reduced aphid vector activity (roughly mid-September). 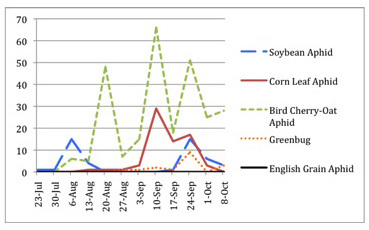 As for soybean aphid during the 2011 growing season, we can expect low-level flights from buckthorn to soybean over the next few weeks. However, surviving colonies will start to build with warmer weather and will eventually move from buckthorn to soybean where colonies can further build and disperse. Soybean aphid scouting and economic threshold recommendations will be in full effect, as usual, throughout the coming season. Acknowledgements: Special thanks to Wisconsin soybean aphid suction trap network collaborators – Andy Merry, crop consultant (Antigo), Cullen lab, UW Madison Entomology and Arlington Agricultural Research Station (Arlington), Scott Chapman, UW Madison Entomology (Hancock), Tim Wood, Lancaster Agricultural Research Station (Lancaster), Dennis Laskowski, grower, Bill Schaumburg, crop consultant, and Kevin Jarek, UW Extension Outagamie County (Seymour), Mike Cerny, grower, and Peg Reedy, UW Extension Walworth County (Elkhorn), Patrick Branick, Pioneer (Eau Claire, Pioneer). The Wisconsin soybean aphid suction trap network was established in 2005 with a grant to E. Cullen from the Wisconsin Soybean Marketing Board. The network is funded in 2011 jointly between UW-Madison Entomology (Cullen) and Great Lakes Bioenergy Center (Doug Landis, Michigan State University).